“One warm, rainy summer, Freya Dane, a PhD candidate in archeology arrives on the ancient Scottish island of Findnar. Estranged as a child from her recently dead father, himself an archeologist, Freya yearns to understand more about the man, his work on the island and why he left her mother so many years ago. It seems Michael Dane uncovered much of Findnar’s Viking and Christian past thorugh his search for an illusive tomb, and Freya continues his work. The discoveries she is destined to make, far greater than her father’s, will teach her the true meaning of love and of loss. AD 800, and a wandering comet, an omen of evil, shines down on Findnar. The fears of the locals are justified. In a Viking raid, Signy, a Pictish girl, loses her entire family. Taken in by survivors of the island’s Christian community, she falls in love with an injured Viking youth left behind by the raiders and is cast out. Confused and bereft,eventually she becomes a nun, a decision that will unleash tragedy as she is plunged into a war between three religions. Forced to choose among her ancestors animist beliefs, her adopted faith and the man she loves, Signy will call out to Freya across the centuries. Ancient wrongs must be laid to rest in the present and the mystery at the heart of Findnar’s violent past exposed. 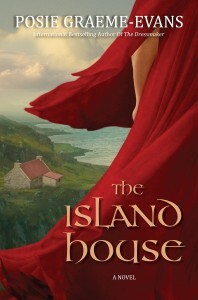 Publication of THE ISLAND HOUSE (in hard back) will August 2nd in the UK (the day after my birthday. Excellent omen!) and the book will be released in Australia at the beginning of November. Haven’t yet seen the Australian cover – it’s being designed at the moment – but will post that, too, when I have it.